I often make prototype PCBs on my LitePlacer pick & place machine. The SMT parts usually come packaged as cut tape, as I do not require large enough quantities to justify buying full reels. The last objective might be the most important. Per job I only want to setup the tray and teach the machine part locations once. Afterwards, the process of loading parts should be easily repeatable and thus significantly reduce manual effort. My system consists of feeder blocks each measuring 98mm x 58mm. Multiple feeder blocks can be arranged on a tray. 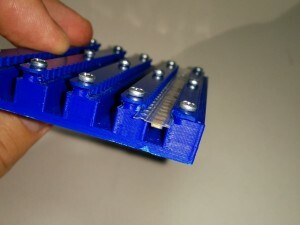 Each block contains neodym magnets so it can easily be attached to any magnetic surface. To allow for repeatable positioning, the blocks also feature holes for 3mm centroid pins on the bottom side. The pins are designed to mate a 10 x 10mm grid of holes. The feeder blocks come in different designs for different kinds of tape. The lanes for tape strips are layed out in a 8mm grid, so I can make blocks which hold 4x 8mm tape, 3x 12mm and so on. This grid makes the location of the next tape predictable per tray. Using standard tapes (4mm part pitch) each lane can take up 24 parts. The tapes are being held down by U-shaped lids which are screwed to the feeder block. The pressure can be adjusted to hold the tapes in place firmly. I made different versions for paper tape (about 0.8mm thick) and embossed plastic tape (about 0.1 – 0.2mm thick) – the versions for plastic tape have a cutout which should fit most parts. My default tray measures 220mm x 200mm and takes 6 feeder blocks. 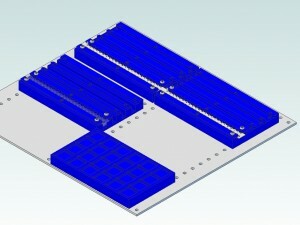 I can fit 3 of those trays into the working area of my PnP which is usually enough parts for a small batch of boards. 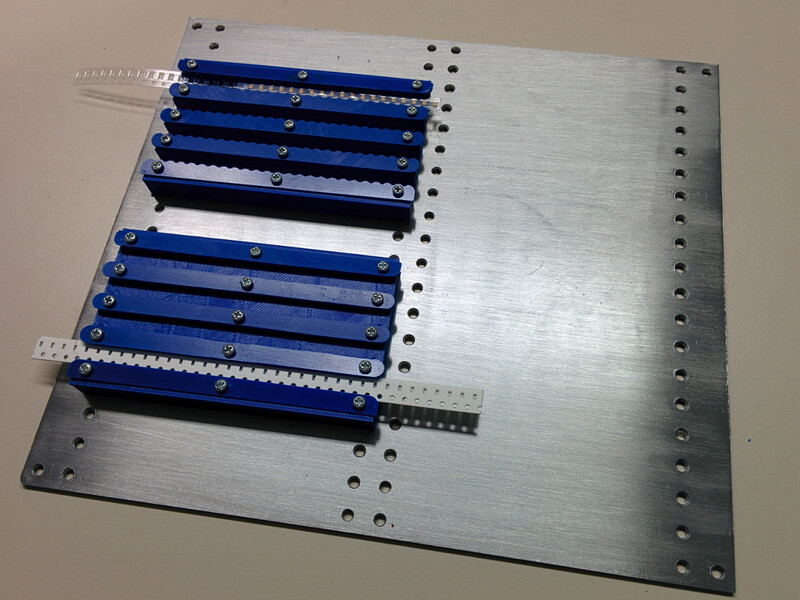 The tray again has holes for centroid pins to make positioning the tray repeatable as well. 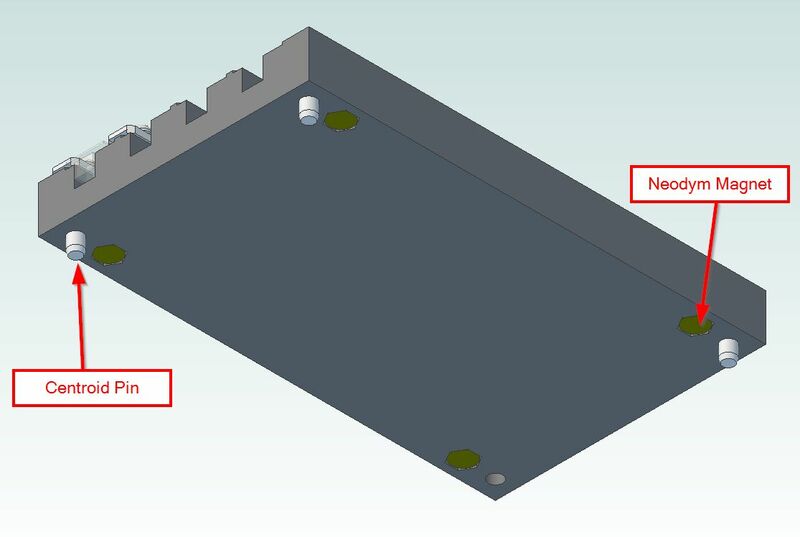 I am sharing the STL files for the 3D-printed parts and a DXF for the tray under CC BY-NC-SA 4.0 license. The parts are designed to print best with a 0.4mm nozzle.The archive contains different block layouts and for each layout a version with and without lilypads (to enhance bed adhesion if needed). Please mind that ABS shrinks quite a bit. I suggest to print one sample first and measure it, e.g. horizontal centroid hole distance should be exactly 90mm center to center. Then, calculate a scaling factor and apply it in your slicer. Printing FormFutura Easy Fill ABS on my Ultimaker2 I have to apply a scaling factor of 1.009 in Cura. 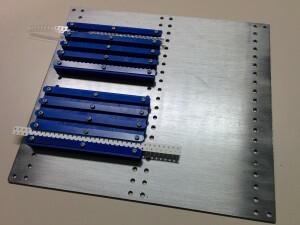 I had the trays laser cut from magnetic, stainless steel (EN 1.4016). 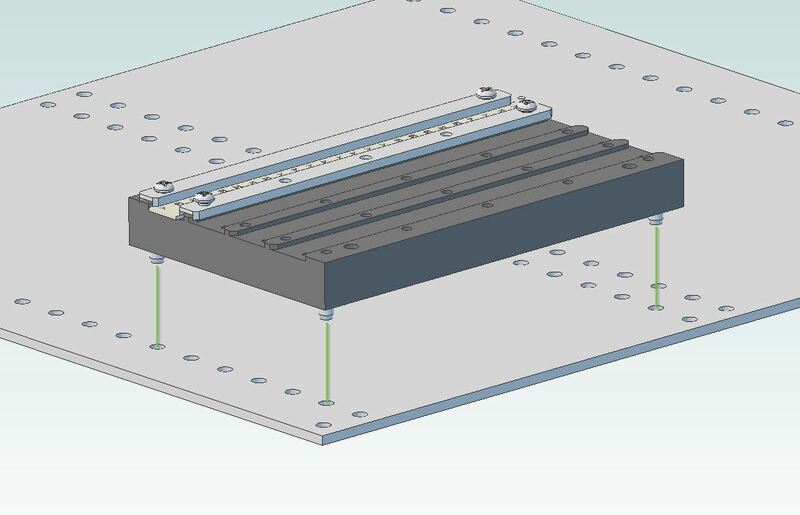 If you have a CNC mill capable of cutting steel you could also make the trays yourself; even a drill press might work if you don’t mind the tedious work. Panhead screws for plastics, 2.2mm x 6mm; 12x per 4-lane feeder block; 9x per 3-lane, etc. If you do not own a 3D printer but want this part, I might be able to print one for you and sell you the finished product. Is it possible to get these files a STEP or IGES models? I would be happy to share STEP files, but unfortunately my „cheap“ version of Cubify Design (aka Alibre CAD) does only export 3D models as STL. Would the AD_PRT files help? I could also convert STL back to STEP, but then most parametric information would be lost and the part would appear as one solid object. Yes, the AD_PRT files would be great. Going to try to mill them on my CNC machine. Hey thanks for this post. Warming up my printer right now.